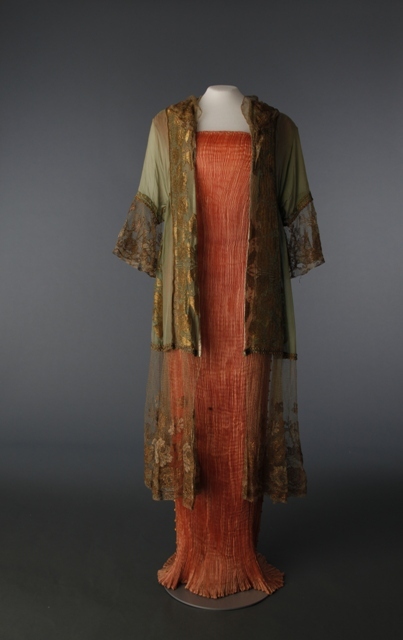 The Drexel Historic Costume Collection at the Antoinette Westphal College of Media Arts & Design, Drexel University is known by fashion historians as a gem of a collection - small, but of very high quality. The upcoming exhibition curated by Clare Sauro called "Brave New World: Fashion and Freedom 1911-1919" should raise the profile of the collection, bringing it to the attention of many others as an invaluable resource. Fashion Projects is very pleased to present the following interview with Sauro about her upcoming exhibition and her role as Curator of the Drexel Historic Costume Collection. Besides juggling her curatorial duties, Sauro also teaches in the University and is writing an upcoming book by Berg Publishers titled Jeans (along with Drexel colleague, Joseph H. Hancock). She used to supervise the Accessories Collection and work as the Assistant Curator in the Costume Collection at the Museum at FIT, which is where as a student I first had the opportunity to experience her enthusiasm and desire to share her knowledge about fashion history. Fashion Projects: The title of your exhibition is highly evocative, even though the time period of your exhibition predates by a decade Aldous Huxely’s novel of the same name. What inspired you to curate an exhibition called "Brave New World" about this moment in fashion history? Clare Sauro: Congratulations on being the first to pick up on that! While the Huxley novel was published much later, it is part of the general modernist literary movement that emerged during this period. While purists may balk at my use of the title, I felt it was intriguing and captured the spirit of the exhibition. I wanted the title to convey this sense of wonder, excitement and anxiety and felt Brave New World was just right. The literary work I was most closely drawn to during my research was Pale Horse, Pale Rider but thought a reference to the apocalypse was a bit much for a fashion exhibition! One of the themes of the exhibition (and PIFA) is the cross-disciplinary explosion of creativity that occurred during this period. The 1910s were a transitional period where the lingering traditions of the 19th century gave way to the modernism of the 20th. Many art forms struggled against tradition and sought new, often radical forms of expression to make sense of modern life. Fashion was a part of this movement and during this brief time period, women adopted short skirts, abandoned their corsets and cut their hair. The difference between a fashionable woman of 1910 and a decade later is astonishing. What are your favorite objects in the exhibition? Were there any objects that you wish you could display (extant or not) that could have enriched your story even further? The exhibition is relatively small (14 garments) so everything on display is a favorite in some way. The DHCC is fortunate to have many examples from this particular period and I had many to choose from when making my selection. Despite this, I searched and searched but did not turn up a Poiret from the teens. 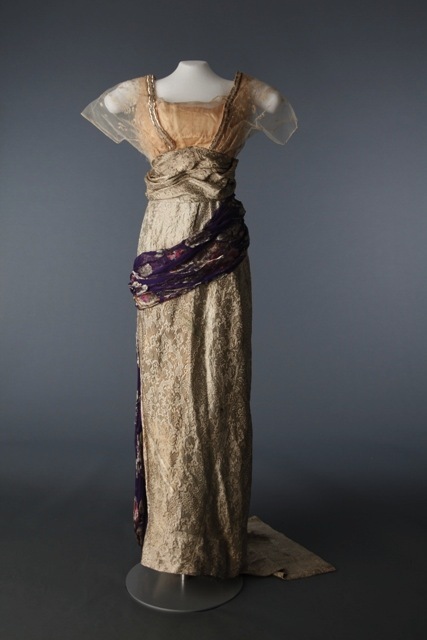 However, I was able to unearth a gorgeous Lucile evening dress (circa 1914) which conveys the right sense of luxury, sensuality, and exoticism needed for the exhibition. It really is a spectacular piece and the star of the show. Unfortunately, it needed conservation and missed the deadline for photography. I guess that means you all have to come see it in person! All of the pieces are from the Drexel Historic Costume Collection. Can you tell us a little bit about the collection as a whole? What are you goals for your collection? The Drexel Historic Costume Collection is a relatively small (10,000+ objects) collection of historic costume but a good one. It was founded in the early years of the 20th century to support and inspire the students of Drexel University. Since the collection began before many others of its kind, we are blessed to have strong holdings of early 20th century couture. There are some sizable gaps in content but overall the collection is of extremely fine quality. I have been curator of the DHCC for a little over two years and hope to someday establish it as one of the preeminent university costume collections in the United States. I plan to achieve this through judicious acquisitions, careful deaccessions and increased visibility through exhibitions and publications. I am fortunate to be very happy here at Drexel because I have quite a lot of work ahead of me! You used to supervise the Accessories Collection and work as the Assistant Curator in the Costume Collection at the Museum at FIT (Fashion Institute of Technology). Interestingly both MFIT and Drexel collections are housed at teaching universities. Have you found there to be similarities and differences in how the collections are used? How has your role changed? I believe strongly in teaching collections. I get a great joy from sharing objects with students and seeing the lightbulbs go off over their heads. MFIT is a large and well-established collection with a conservation lab and dedicated galleries. While the collection is used for teaching and research it still adheres to established museum standards of care. The DHCC is much smaller and I am the only official staff member. As such, I have to handle all responsibilities related to the collection and must wear many hats. This is very different from MFIT where I was able to hand over a task to another staff member and know it would get done. Here at Drexel, I rely on students for day to day collections management and spend a good deal of time training them in correct handling protocol and basic registrarial work. Despite this, I would be lying if I said I didn’t enjoy the challenges of this position and the opportunity being able to really make a difference. It is exhausting but extremely gratifying. I love teaching, something I did not get to do while I was at FIT. It was wonderful getting an opportunity to visit your collection last fall at the Fashion in Fiction conference held at Drexel University. Your personalized tour was inspiring as you revealed the joys and difficulties in discovering and caring for your collection. Would it be possible to talk about any special “a-ha!” moments you’ve had? Fashion historian Rebecca Jumper Matheson will give the lecture “Beyond Romanticism: The Art, Commerce and Modernity of Lucile” on Thursday, April 14th at 7 PM as part of the exhibition. Gallery Hours: Monday - Friday 11 a.m. - 5 p.m.